Last night, 8th Jan, the club enjoyed a very interesting and entertaining talk, Compose Yourself, presented by Jonathan Vaines, on photographic composition. In two hours Jonathan covered a lot of ground. The talk was lavishly (I just mistyped that last word and the spell checker almost had me change it to lasciviously, hmmm, maybe not) illustrated with numerous examples from his and Sue’s many award winning pictures plus some new photographs taken especially for this talk. I am sure we all left with a greater understanding of this aspect, a hunger to learn more, and a few new jokes. Jonathan had not given this talk before **. Bruce had trusted Jonathan and had asked him if he could give a talk to the Bedford CC entitled Composition. Possibly, without thinking too hard about how many countless hours it would take to put together, he agreed. But once he realised the enormity of the task Jonathan did the sensible thing, he backed out of it. No he didn’t, he began researching how other photographers had structured this topic. Then incorporating his knowledge whilst also drawing from their approaches he created his very own own talk and take on the subject. He also added a few extra, bonus thoughts on topics beyond standard composition. Golden nuggets all. What, no notes! Correct, Jonathan did not put together a set of notes from the talk as these would fill a book or two. 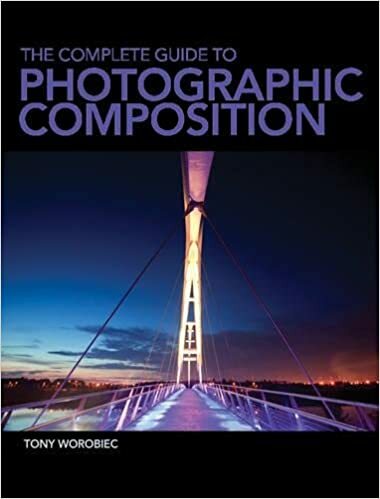 To learn more about many of the compositional aspects that Jonathan covered last night you could do much worse than purchasing the book The Complete Guide to Photographic Composition by Tony Worobiec. Tony Worobiec, FRPS and 18 years as head of a large design faculty, is a top English travel and landscape, fine art photographer, teacher and prolific author. This book covers much of the same ground as Jonathan’s fact-filled talk and also includes further aspects to consider.